Steven cheers up Sadie the only way he knows how: with an invitation to band practice. Summary: Steven visits a tired, harried Sadie at the Big Donut. She explains it's not that she's doing any more work without Lars around, but he at least made the time go by faster. She asks about his huge order, and he explains its for his fellow bandmates, the Cool Kids, and invites her to come by and watch them jam after work. Buck, Sour Cream, and Jenny tool around trying to find their sound before the upcoming concert Buck has booked them for. As they're rapping up Sadie shows up and is disappointed that they're done. The next day, they surprise Sadie as she's coming home. She invites them down and hurriedly tries to clean her room, but Buck discovers her collection of old horror movies. They put on The Lurch and they like its sound, and Sadie is inspired to sing about her frustrations with her job. They invite Sadie to her their frontman but she demurrs. Later at the Big Donut, Steven asks her about lyrics advice because he's just too cute and carefree to capture her feelings. Sadie is surprised to hear how angry she sounds to Steven. That night, as the band leaves for their gig Sadie shows up to join them at the last minute, exclaiming she will be at every gig and practice from now on because she QUIT! Poster notes: I hope now-jobless Dewey ends up working at the Big Donut. The status quo continues to change. 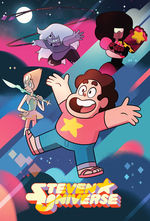 Even if the Diamonds never attack, Steven's human world is turning upside-down. SDCC a few months ago, they revealed what Lars has been doing all this time. It's pretty dang awesome, but would be a serious spoiler here. If you don't mind that kind of thing, you should go check for it on YouTube. Lars and Sadie have been working the Big Donut since the very first Steven Universe pilot. In fact, Rebecca Sugar has said Lars and Sadie are characters that predate the rest of Steven Universe. The fact that Lars is now a pink zombie in space and Sadie is frontman for a horror-themed band and neither is working at the Big Donut any more is arguably the biggest change in all of Steven Universe. I loveeeeeeeeed Sadie Killer. I love that the cool kids remain actually cool, I love that Sadie found a way to express herself musically in a way that made her comfortable, I love that she's free of her dead end job. Loved it. Every bit. Ah, here we go. Weird, eh? top comment: "Dancing lesbians are very prominent on rebecca's work"
i love Sadie episodes. this one was super relatable even though i like my job, but that sense of deadendness is prevalent in other aspects of life. Between Sadie’s working dead song and Peedee’s lament I feel like Rebecca Sugar has some opinions about the plight of the working class. I really love Kate Micucci's VA work on this song. Over the top, in just the right way. I was surprised the cool kids didn't invite Sadie into the band in the first place -- didn't she jam with them in the episode where Lars didn't show up with the purple cake? OHenryPacey: It's possible that Steven suggested that they don't invite her after how much he traumatized her back during the Beachapalooza episode. I love that Sadie's a working class punk. Last episode they hopped a freight train, this episode they start a punk neo-Bauhaus.